In case you missed it, earlier this week, we unveiled our initial power rankings for the ACC’s Atlantic Division (see link). College FootBlog continues our breakdown, this time with the teams from the Coastal Division. From all indications, the Coastal Division is much deeper than their friends from the Atlantic. Let’s take a look at what we should expect this fall. 1. Virginia Tech: Although the Hokies lost a lost a lot on defense from last season’s squad, they were able to retain defensive coordinator Bud Foster despite him being on several programs’ wish list during the off-season. Even with the youth and inexperience, it would not be wise to count the Va Tech defense out as long as Foster is running the show. Offensively, the Hokies may have a running back tandem that can rival any other tandem in the country, including Alabama. We already know what to expect from Sophomore Ryan Williams, who rushed for over 1,600 yards last season, but the Hokies also return Darren Evans, who missed last season with an ACL tear. 2. Miami: After a 9-4 season in ’09, the Hurricanes are looking for an ACC Championship this season. Randy Shannon’s team benefited greatly from a coaching overhaul last spring, and the results spoke for themselves last fall, especially on offense. Jacory Harris returns at quarterback and will try to pick up where he left off last season, when he completed nearly 60% of his passes for over 3,300 yards. Linebacker Sean Spence leads the ‘Canes defense, which was young but talented last season and still ranked 29th nationally in total defense. The November 20th match up at home against Va Tech will have major implications on who represents the Coastal Division in the ACC Championship Game. 3. North Carolina: Butch Davis has done wonders in Chapel Hill, especially on defense. The Tar Heels ranked sixth overall in total defense last season. Linebacker Quan Sturdivant is a legitimate potential first round draft pick in next spring’s NFL Draft. As great as the UNC defense was last year, the offense was anemic. The ‘Heels ranked a dismal 108th in total offense last year, and that must change if they want to challenge Miami and Va Tech for the Coastal Division crown. That means quarterback TJ Yates must improve on his 14 TD/15 Int’s from a season ago. 4. 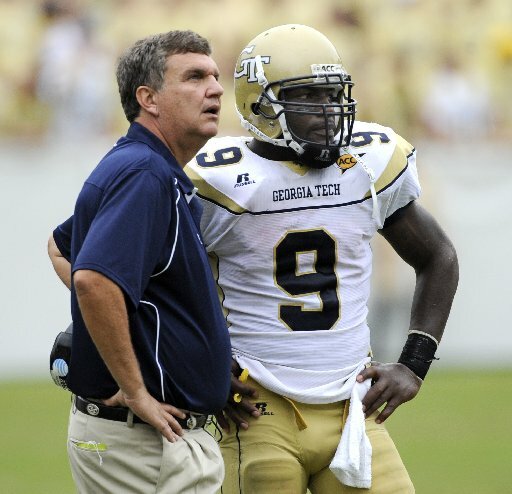 Georgia Tech: We will see how much the loss of running back work horse Jonathan Dwyer will affect the offense, but quarterback Josh Nesbitt returns for his third season as the engineer of Paul Johnson’s tricky, triple option offense. Running back Anthony Allen appears to be up the challenge of filling Dwyer’s role, but defensively, the Jackets must replace first round draft pick DE Derrick Morgan and long-time starter at safety, Morgan Burnett, which could be a daunting task. 5. Virginia: First year head coach Mike London has his work cut out for him, but Cavaliers fans are hoping he can bring the same results that he has produced throughout his career, specifically when he was their defensive coordinator from ’06-’07. In that short amount of time, London’s defenses were among the nation’s finest, and handed the Miami Hurricanes their worst ever loss at the Orange Bowl when they shut them out 48-0. With his ties to the Hampton Roads area and his tenacity as a coach, Virginia should be better, but it will likely take a couple of years before we see the Cavs making serious waves in the ACC. 6: Duke: The Blue Devils round out our power rankings for the Coastal Division. After a couple of season’s head coach David Cutliffe has made strides and last season coached them to a 5-7 record, which is quite an accomplishment, considering that is the best record in Durham since 1994. The departure of quarterback Thaddeus Lewis will hurt Duke quite a bit, and there appears to be no one who can fill that void. Look for Cutliffe to be under .500, but he will likely be rewarded with another head coaching opportunity after this season. Next week, College FootBlog will take a look at the Big Ten in another two-part breakdown. Let us know your thoughts on our ACC breakdown and our power rankings that will be published in the next couple of weeks.